You will marvel at the panoramic views of the entire Na Pali coastline from Haena to Milolii while your crew sets up a delicious luau style, buffet dinner. Sip cocktails as you watch the late day sun paint a rainbow across the clouds and the stunning coastline cliffs of the Na Pali shore. The crew will keep you entertained with local stories about the sights along the way, as you relax on the spacious 65' catamaran. 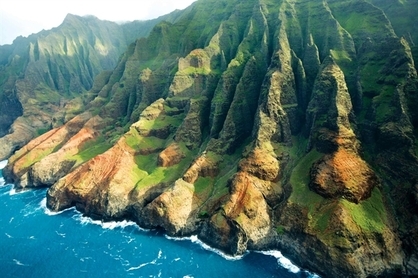 The afternoon lighting is unforgettable as it streams into the valleys of the Na Pali Coast. Beer, wine and Mai Tais are served along with a champagne toast at sunset. 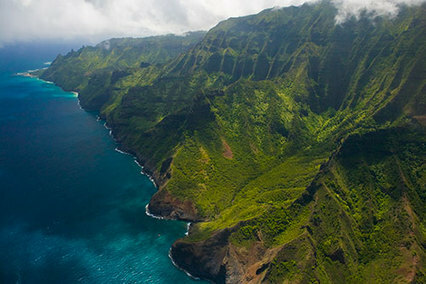 Includes: A beautiful trip down the Na Pali coast, a buffet dinner and drinks. Important Information: No pregnancies, no neck or back injuries or recent surgeries. There is no snorkeling on this trip. No children under 2 years old. Passengers must be able to manage stairs. I suggest wearing layers including a jacket for evening temperatures on the water.